It’s all about you losing and controlling you’re weight Now – Naturally, effortlessly, simply with minimal cost! If you’ve ever embarked on a weight loss regime and gone through all the discipline requirements of eating the reduced food intake levels required by your new diet and lost weight, purchased a new wardrobe (extra cost), and then carried on with your life … Only to put that weight back-on, plus-some (more cost plus frustration) then you’re not alone – This happens to 95% of all present dieters and slimmers. Failed Weight Loss Regimes Cost on Average £1,000 p.a. Many unfortunate victims of the present dieting and slimming debacle carry on trying to lose weight – failing time after time, year after year often paying about £500 p.a. for a Gym; £20 - £200 p.m for various slimming pills and potions and appetite suppressants only to suffer see-sawing weight levels requiring additional spending on clothes etc. For would-be weight losers overall annual all-in costs of £1,000 per year are about average and £10,000 - £30,000 over a 10 – 20 year period the norm and they are still overweight plus they have all of the frustration and negative self esteem that grows with failure – none of which is their fault. Think what you could do with all that money if you saved it … holidays, beauty treatments, or your own pension – the list of possible alternatives for that money is endless! If all that sounds familiar then your problems could be ended by the new “Get Slim Be Healthy” presently being launched by Summerville Publications. Designed for home use it could also prove useful to employers who want to help overweight staff as well as life coaches. It will help you slim anytime – naturally, simply with minimal cost without resorting to the existing plethora of dieting, slimming and exercising regimes. “Get Slim Be Healthy” will be helped to determine your ideal weight and what foods you can rely on to remain healthy and avoid overweight which in turn will help you chose suitable recipes and often adjust existing ones all without traditional dieting i.e. food denial. It highlights ‘The Myths’ that “You Are Overweight Because You Eat Too Much” or it’s “Your Lifestyle” – both of these statements are nonsense, as is the ‘lack-of-exercise-con’. Note: Seventy-percent of dieters are women … I challenge anyone to analyse all the chores regularly carries out by 99% of all women including caring for babies, shopping, washing, ironing, making beds, preparing food, cooking, washing-up, getting children up dressed and to school, getting children from school and later to bed etc. etc. etc. … Oh I forgot to mention - many women are also holding down a job … often fulltime. Nobody can convince me that’s ‘Lack of Exercise’ anymore than they are overweight because they eat to much, or it’s their lifestyle and the latter two statements also applies to men and children. All of this is explained in “Get Slim Be Healthy”. In addition you will learn how and why the original dieting, slimming and exercising industries were formed to cater fro the physiological needs of men and women at a ‘cosmetic level’ and why this does not work for today’s overweight people. . This is referred to in “Get Slim Be Healthy” under the heading “The Weight We Were, & The Weight We Are”. We are now in the midst of “the Great Overweight and Obesity Pandemic” that is increasingly threatening, complicating and leading to early death for millions whilst now affecting up to 600 million people on this planet. Also of concern for most families is that the victims of overweight are getting younger and younger … It’s not just the ladies that need to worry about their figures it’s the whole family. Our problems start at birth with food companies waging a massive non-stop-war to misinform backed by highly planned and targeted food offers where the product is designed to train your taste early to ensure you become addicted to the wrong foods which kill the taste of other fillers all of which add worthless mass to what you unwittingly believe to be good wholesome food … Whilst stacking up hundreds of millions of extra profits to the food industry, the big stores and government coffers and creating massive avoidable backlogs in dental and doctors surgeries and hospitals for more people to make more unearned millions whilst the general public suffers. It’s time to bring these factors into the open and stop the people being subjected to “The Killer Foods” which have little or no nutritional content. It all starts with sweet tasting baby foods with unnecessary sugar or other sweet tasting additives and later sweet tasting toothpastes. By the way you can clean your babies gums and later teeth by making you own crushed apple and rubbing on the areas concerned if you so wish. You will learn that overweight in today’s scenario is not only a cosmetic matter only of interest to women but affects the whole family. Overweight today is symptomatic of a whole range of afflictions and diseases which can also lead to an early death (up to 20 years or more) and in virtually all cases are largely avoidable. Readers will also learn how 14% of all women are victims of one condition – often increasingly from the early thirties or earlier, a condition which amongst it’s symptoms can lead to overweight and is mostly misdiagnosed and treated (wrongly) with anti-depressants often for years (unnecessarily). We’ve all heard it before – it’s your early childhood, it’s your partner, it’s the children, it’s you’re lifestyle. What Rubbish! This condition in most cases can be controlled if not fully eliminated for 86 pence ($1.70). In addition readers will also be educated on a condition (denied by the medical profession as non-existent) that affects up to 20% of all adult men and women and leads to overweight and on to all the major Killer Afflictions and Diseases which largely avoidable. 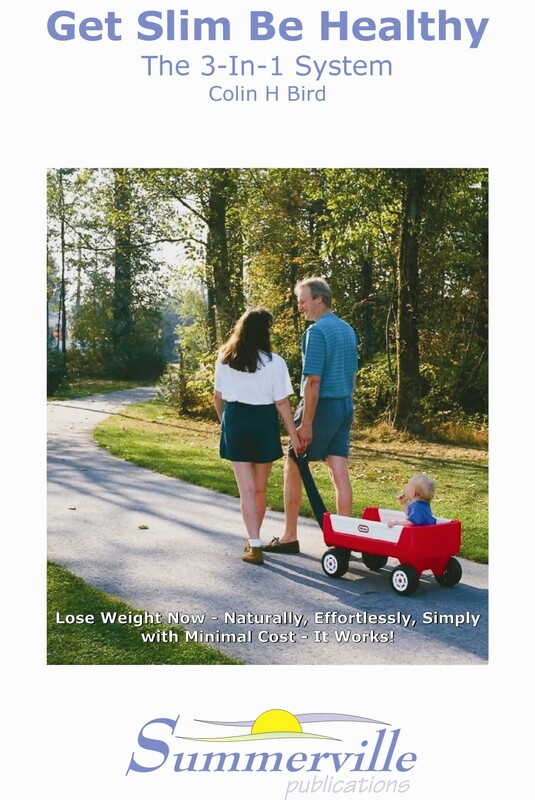 The manual is designed to inform the public globally of how to successfully lose and control weight, avoid a host of afflictions and diseases now threatening the wellbeing of the whole family whilst saving a packet of money at the same time. You can achieve all of this without the present dieting, slimming and exercising regimes. To learn more and get your own copy go to http://www.GetSlimBeHealthy.com whilst stocks last for the nominal price of £47.00 plus £4.95p&p. Note: The author does not claim to be a doctor or any other health specialist – simply a guy whose wife was struck down out-of-the blue without warning whilst out for a walk one quite Sunday Afternoon … And who himself, later on in life experienced weight problems like millions of others then and now. And who was forced by necessity to seek answers to apparently unidentifiable problems that are repeatedly misdiagnosed and treated – like millions of others by the medical profession. Eventually he found the answers – because he refused to give-up the quest for the truth and his family’s health and subsequently his own overweight problems. One factor that surprised him was the unforeseen link of pre and actual overweight conditions with the afflictions affecting his wife 7 years earlier (who wasn’t overweight at the time), how this is a factor of overweight and eventual ill health and in increasing numbers of cases premature death for millions … And largely and conveniently kept quite by politicians, the medical profession, the drugs industry and the food industries. So when he tells you he tried everything going, to a greater and lesser extent … And just spent money (thousands), time, and effort and a lot of nervous energy on all the stuff out there which unfortunately didn’t help … Particularly long term – he means Just That … Then you will understand when he tells you that this system gives you the benefit of his experiences gained The Hard Way with the fervent hope that if you apply the information therein it will also benefit you …And as Many of the millions of victims worldwide as possible. Colin H Bird, Author, “Get Slim Be Healthy”, the 3-In-1 System. © 2008 All Rights Reserved. This press release was distributed by ResponseSource Press Release Wire on behalf of Summerville Publications in the following categories: Children & Teenagers, Men's Interest, Entertainment & Arts, Health, Leisure & Hobbies, Women's Interest & Beauty, Environment & Nature, Sport, Food & Drink, Travel, Medical & Pharmaceutical, Media & Marketing, Farming & Animals, Retail & Fashion, Public Sector, Third Sector & Legal, for more information visit https://pressreleasewire.responsesource.com/about.